Amy and Scott Tie the Knot at their Wakefield Plantation Wedding! Amy and Scott and I met on January 9th to plan their wedding ceremony set for March 26, 2011 at Wakefield Plantation Country Club. They wanted a small wedding with family and close friends and not a lot of fanfare. They chose to have no attendants and therefore we did not have a rehearsal. We got to work on their ceremony right away. Part of the ceremony was their story which I began to piece together from their answers to questions I asked. They sent me some very good material so I was able to write their story that included a lot of humor. During the ceremony creation process they happily discovered that they were expecting a baby in September so we added a blessing for the unborn baby to the wedding ceremony. When we arrived, the cake by Cake Dreams by Sally was already there. Such a pretty cake following their color scheme of pink and green. After a week of unseasonably warm weather in Raleigh, March 26 turned cold with drizzling rain but it was cozy and warm inside the Wakefield Plantation Clubhouse. Jacklyn, the venue's event coordinator was on hand to answer questions, coordinate vendors, and help sneak the bride up to the door from where she and her father, Wayne, would enter. Thanks, Jacklyn! The tables were all set with the pretty linens, flowers , and special favors from the couple. Amy and Scott got cookies that she grew up savoring. Amy's mother, Gail, was there and ready to celebrate. We can see where Amy gets her beauty! Ed Stephenson and Craig Hanemann were our musicians from Arioso Strings. I do a lot of weddings with these two guys and it was good to see them after the winter hiatus. This wedding is our first together for 2011. They were in fine form too. This is a beautiful ice sculpture. I don't know who to credit for this lovely work of art. When all the guests were seated, we began the processional with the grandparents. Then his very elegant mother and father processed in (above). You can see where Scott gets his good looks! Scott and I came in and took our places in front of the fireplace. Thankfully someone had discovered he had forgotten to eat something before the wedding and gave him a plate of hors d'oeuvres which he gobbled up. I found out years ago that the combination of hunger and nervousness can lead to falling out and we don't want that at a wedding! Here comes our beautiful bride. She was a bit nervous too and told me she was worried about crying during the ceremony. Crying is perfectly fine. In fact, I would be a bit concerned if no emotion was showing on your wedding day. That's why I carry a hankie for the bride and groom, just in case. Both of them needed it today! We included a Parents' Blessing which is a thank you and tribute to the couple's parents. Here they are standing to receive the tribute. And, we included the baby! I ask the couple to put their hands on the baby while I read the blessing. Next up was a reading of "The Art of Marriage," a popular reading for a wedding by Wilfred Arlan Peterson that they asked Amy's friend, Wendy, to present. Then Elli, Scott's sister, read to us the beautiful "A Blessing for a Marriage" by Unity Minister, Reverend James Dillet Freeman. It was time now for the couple's story. I took that opportunity to step out from behind them and away from the warmth of the fire behind me to speak to our guests who thoroughly enjoyed the story of how Amy and Scott first met on Match.com then Facebook becoming on-line buddies for almost a year before they met each other in person. And when they did, the rest, as they say, is history. The grand finale was the kiss and they did as I suggested--make it long enough for your photographer to get a good shot! April Sirit of Evoke Photography and her assistant Rebecca were our photographers. Amy and Scott, I am so happy you found each other, and found me! I know you have a very bright future together and please keep me posted next September when your baby boy is born! Great Wedding at Caffe Luna for Kelly and Chris! Kelly and Chris were set up by friends and Chris' younger sister who thought they should meet. It took a while for them to find the right date and time to meet but finally they did. And, they really clicked with each other. Chris proposed three months later and they set a wedding date of March 19, 2011 and began planning the wedding, an experience that was exciting but also quite stressful. Nothing new about that stress factor! 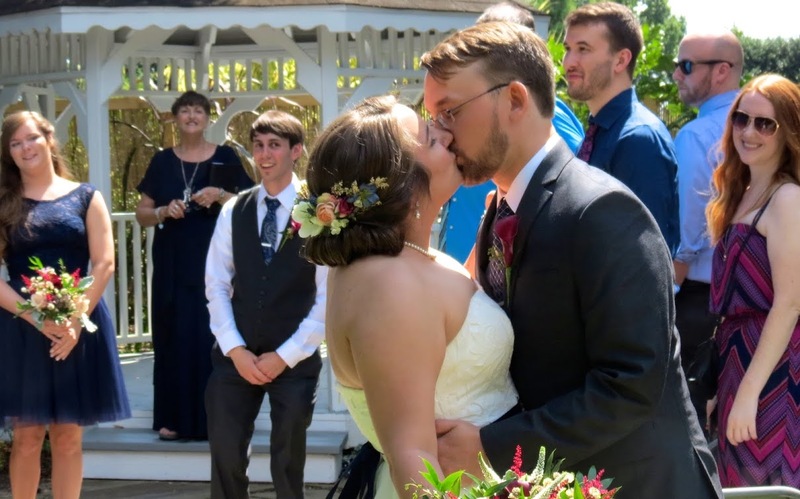 At any rate, they did well and created a lovely wedding at Caffe Luna, a really fun place to have the ceremony and celebrate with their families and friends! When all the guests had arrived, we began with the seating of the mother of the groom, Debbie, by Chris' stepfather, Bill, also groomsman. Sandy, mother of the bride, was escorted in by her son-in-law, Billy. The processional got a bit out of order as the ring bearer, Hunner, and the flower girl, Becca, came down the aisle next, but really, what does it matter! Our pretty bridesmaids were wearing Horizon Blue, a very electric and happy color! Kelly and her father, Rich, make their grand entrance. Kelly was beaming. The sun was streaming in the windows of Caffe Luna that Saturday morning and we were bathed in golden light, how heavenly! Chris' Aunt Kelly read "The Art of Marriage" by Wilfred Arlan Peterson and we all turned toward her to listen. Kelly was one of the most calm and collected brides I have ever experienced. She was just taking in the moment as I told their love story. Chris was pretty happy and calm too. Hey! It is all over and time for pictures and the reception to celebrate this rite of passage for Kelly and Chris. During the ceremony, a little tear--just one--rolled down Kelly's cheek during the ceremony leaving a little tear track in her make-up. She just needed a little touch up blending before the photos. Chris is so glad the ceremony is behind them and is looking forward to their honeymoon! No more stressing! Hooray! This is not the first time I have heard these sentiments from the groom. Their lovely blue and white cake was baked by Simply Cakes. The florist was The Flower Shop of Wendell, and the photographer was Kelly Martin Photography. She had Brittany Jones and Sabrina Short with her as second and third shooters so the wedding was thoroughly covered. Both Kelly and Caffe Luna referred the couple to me. Thanks, Kelly and Caffe Luna! I have done many weddings with Kelly and many at Caffe Luna too. I just love these bridesmaids dresses. The color is so striking and such a festive color. A great choice. Kelly is making one of her funny faces here. She probably developed that talent for her Pre-K and kindergarten students! Chris and Kelly, you know I want all the best for you both and wish you all the joy and love in the world! Courtney and Nik's Wedding at The Matthews House! Courtney and Nik met and fell in love on line in a live chat room back in April of 2008. They started talking right away and Nik told me that her smile and giggles just threw him for a loop. I said, how could you know about her smile and giggles in a chat room? He whispered--webcam! Ohhh. Nik was in Kentucky at the time and Courtney in North Carolina. This communication continued continuously until the day Nik left for basic training and they lost touch. They reconnected again on line and decided to give it a try as a couple although they had never met in person. They did not meet face to face until July of 2009 and they both knew they were right for each other. He of course had to return to his military service and went to Iraq but they never lost touch again and eventually Nik asked her parents for her hand in marriage in April of 2010. Courtney and her parents came to see me on October 18, 2010 to officiate the wedding and of course I was tickled to be able to be a part of this wonderful dream come true. When Marty and I arrived at the stately Matthews House on the wedding day of March 12, 2011, Ross Merle of Just Music DJ was all set up and his wife, Alice, was at her keyboard. What a great deal you get with these two wonderful people and wedding vendors. Alice provides beautiful music for the ceremony then Ross rocks the reception. Ross is also a ham in front of the camera! I love working with Ross. I know that when he is involved in one of the weddings that he will make sure that every vendor has whatever they need and that the couple is taken care of royally. If something needs to be done, he will handle it. With Ross, there is nothing that is not part of his personal job description!! Marty and I look forward to every wedding where Ross is the DJ. The cake was ready too. Simply Cakes was the baker. The Matthews House provides their own in house catering which is so convenient for couples. It is time to begin, guys, so follow me! Nik had 7 groomsmen. He was so excited for this day to finally be here. Here come the bridesmaids, all 6 of them, in their pretty watermelon color dresses. Kinzie was the sweetest flower girl and she was a pro. She walked down the aisle slowly, smiling and tossed the petals then stood quietly in front of the bridesmaids until she tired of that then sat on the front row with Courtney's grandmother, Barbara. Don proudly escorted his beautiful daughter in for this very special day. Don was involved with all the wedding planning and made sure everything got handled. Thanks, Don. Courtney's mother, Evelyn, was also a prime player in organizing and making this wedding day the best that could possibly be for their daughter. And they stepped into the ballroom where all the guests were standing in honor of the bride. Courtney's dress was so beautiful. It's a done deal now! The new Mr. and Mrs. step into their new lives together! Susie McPherson of The Matthews House was our wedding coordinator. She was the first to greet the newlyweds! You might wonder what they are all looking at! Those are all the guests, squeezed together like sardines, looking up at Michael, our photographer, who is on the balcony over the front door taking the group shot of everyone. I know it will turn out great! Michael and Marcy of Michael's Memories were our wedding photographers. I always enjoy working with them! 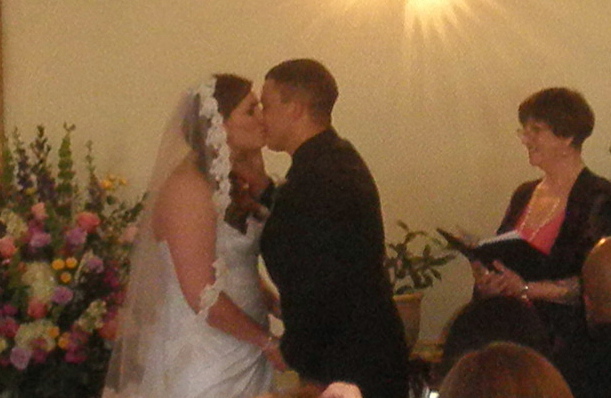 Courtney and Nik, congratulations on your marriage, your wedding and your love! The Knot Hall of Fame Award! Welcome to my blog! I am an ordained non-denominational wedding minister officiating weddings in the Triangle area of NC since 1999. I hope you enjoy reading about the weddings of my couples and find the tips and wedding vendor links helpful in planning your wedding as much as I enjoy writing these posts. I would love to hear what you think about what you see, so leave a comment by clicking on "Comment" below each post. Or, feel free to email me directly. All photos, unless otherwise credited to a professional photographer, are taken with my digital camera by my husband Dave! Go visit my Baby Blessing Blog and see all my babies! Ariel and Trey's Wedding at Bay 7! The New Garden Ballroom at Highgrove!